I recently found a great little place to escape and recharge. 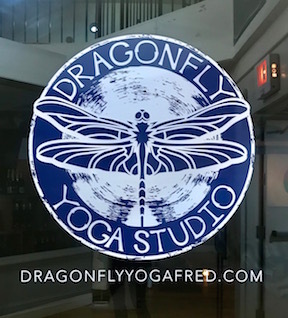 Dragonfly Yoga Studio is located in the heart of downtown Fredericksburg. My new year’s resolution was to be more dedicated in my yoga practice. I have always been a yogi, but sometimes a busy schedule gets the best of me. With a busy year ahead of me, I am committed to making time for myself. I have also introduced the ladies of the Stevenson Ridge office into this fantastic small business. This is a little reminder for those who spend their days battling a commute, prepping for a big wedding, or dealing with everyday stressors to slow down and take a moment for you, whatever that may mean. Self-care is important, and it promotes positivity in all of us.